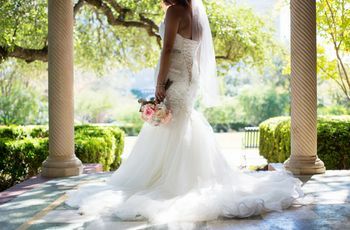 Ever since the obsession with unicorns and mermaids took off, whimsical and fairytale wedding dresses have been in huge demand by brides wanting to embrace an otherworldly look on their big days. At New York Bridal Fashion Week, we saw designers combining elements such as three-dimensional flowers, free-flowing fabrics, ombré colors, princess-worthy silhouettes, and even bridal hoods to create dresses with enchanted, mythical vibes. Soft colors, like pale blues, blush pinks, and lilacs, along with pearlescent tones, also caught our eye. You've seen classic fairytale wedding dresses by now (hello, Kate Middleton), but these playful designs give an entirely new meaning to the term "fairytale romance." Check out these fairytale wedding dresses for the whimsical bride. The entire fall 2019 collection at Ines Di Santo was inspired by a "modern fairytale," and this dress was no exception. 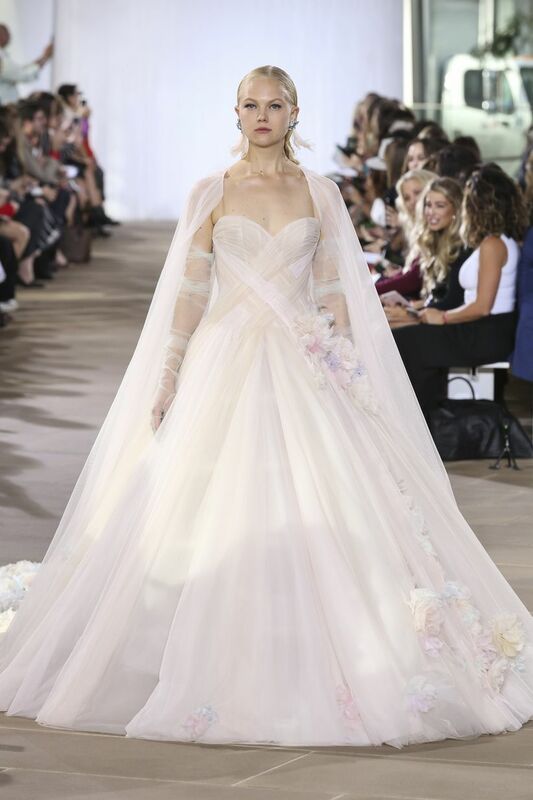 Everything about this ball gown, from its crisscross bodice and barely-there pink hue, to the cascade of handmade pastel flowers and cathedral-length cape, is fairytale wedding dress goals. Pleats and ruffled tiers add to the playful look of this mauve pink dress. It's a perfect choice for spunky brides who want to stand out on the big day! With layers of alabaster tulle, eye-catching horsehair trim, and a one-shoulder crop top, it makes total sense that this fabulous, one-of-a-kind Hayley Paige design is named the "Bradshaw." Maybe it's the corset bodice or the billowing puff sleeves, but something about this dress is giving us modern-day Snow White vibes. We could totally envision this dress in a field of wildflowers or at a forest venue, which would only emphasize the enchanted fairytale feel. Lilac and lavender were two trending colors this season, and we're kind of obsessed with this flowy chiffon gown by Carol Hannah. The silhouette is gorgeous on its own, but the purple hue adds a hint of fantasy that we're loving. 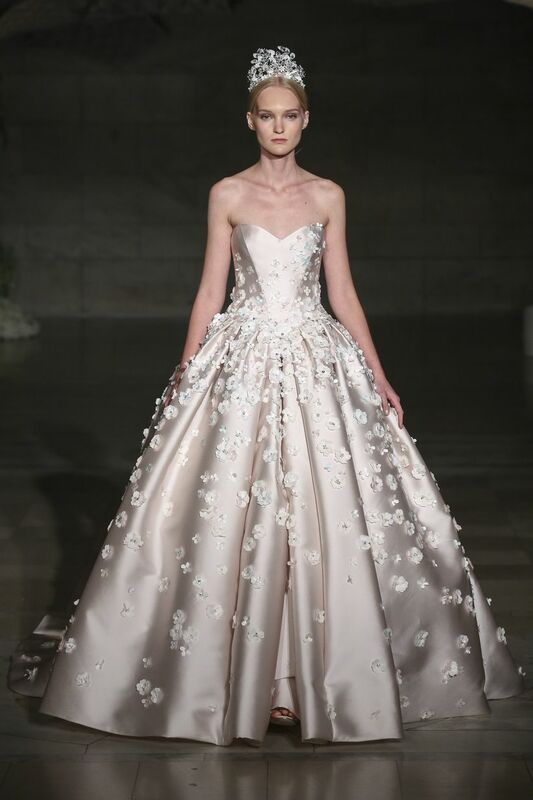 Wear a ball gown adorned with floral appliqués for a modern fairytale look that is truly angelic. Look closely and you'll see that these embellishments aren't flowers, they're butterflies! This subtle detail is a gorgeous option if you're getting married in a garden surrounded by flowers in bloom. The panels of pale pink, ice blue, and silvery tulle on this Willowby wedding dress are oh-so feminine. The short lining lets you show off your legs, while the flowy skirt gives the dress a bohemian princess feel. We can't get over the gorgeous sheen on this champagne silk gown. 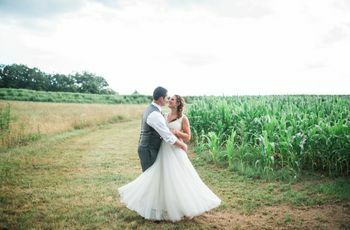 The circle skirt and long ruffle train provide beautiful movement, while the iridescent color will have you looking like a life-size pearl (a goal we didn't even realize we had until now) for your walk down the aisle. 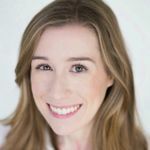 Bridal capes were another reoccurring trend this season, and they're a natural fit for the fairytale wedding dress aesthetic. Pair a cape with a structured gown for a cloak-meets-couture look. Say hello to one of our favorite fairytale wedding dresses for fall 2019! Yumi Katsura adorned this plunging blush gown with an intricately beaded bodice featuring floral and feather-inspired patterns. Going for a dramatic and unexpected look? Wear a wedding dress with a hood and you'll instantly be granted cool bride status. This Ángel Sánchez design is one of our fave fairytale wedding dresses for brides who prefer classic style. The strapless neckline and tulle skirt are timeless with a twist, thanks to the understated pink color. How fun is this dress? The colorful sequins remind us of a rainbow — a perfect way to set the precedent for a cheerful, upbeat wedding day! While this is technically a bridesmaid look, who's to say that you can't rock it as your wedding dress instead? The slip dress and sheer sequin top are a winning combo if you're a bride who isn't shy about going outside the box. Love mermaids? Not only do the watercolor-inspired blues on fairytale wedding dress match the ocean, but the pleated fan bodice reminds us of seashells! The multicolored floral appliqués and feathered skirt on this trumpet gown are fit for any unicorn-obsessed bride-to-be. With iridescent fabric and a lightweight, airy skirt, this Leanne Marshall stunner is our pick for brides getting married outdoors, especially on the beach!